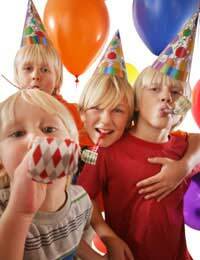 It sounds like an impossibility, doesn’t it - a sugar free children’s party? But it really isn’t. When coming up with sugar free alternatives that are suitable for either children or adults to eat, it is simply just a case of thinking around the problem and finding a few suitable recipes. Kids love sweet things and there’s no reason they shouldn’t be able to have sugar free versions. Those who are diabetics should check the suitability of some sugar free dishes as they may not be ideal for a variety of reasons. Some medical experts suggest too much sweetener is not a good idea, for example, and levels of natural sugar in foods also have to be considered by diabetics. But for those parents who are simply trying to reduce the amount of sugar their children consume for other reasons, these suggestions will go down a treat. Many sandwiches served at a children’s party will of course be savoury. Those trying to avoid sugar can tuck into the likes of cheese, ham, tuna and marmite sandwiched with abandon. When serving peanut butter, however, remember to check the jar carefully. Some varieties do include sugar. Look for a whole nut product that includes little else besides the peanuts and peanut oil, and you won’t go wrong. Supermarkets and health food shops should have plenty to consider. If you would like to serve a sweet sandwich or two as well, then there are, of course options. Honey is always a popular sweet party treat, particularly on picnics, and you could use sugar free jam. This comes in all sorts of flavours and can be teamed up with cream cheese or peanut butter to make an exciting, delicious filling. Most savoury snacks should be fine to serve at a sugar free children’s party. Remember to check ingredients levels to be sure, however. Sugar does sneak into products in the most unexpected places. Alternative savoury snacks for a children’s party include homemade popcorn. Try a microwaveable version or pop it in a pan yourself and add butter and salt. Popcorn does not have to be sweet to be tasty. Or make your own cheese straws. Try versions using cheddar and red Leicester to vary the colours. Healthier savoury snacks that go down well at children’s parties include carrot and cucumber sticks, cherry tomatoes and cubes of fresh cheese. Make little fairy cakes to serve up, using honey instead of sugar. Here’s a simple recipe that works well and the youngsters will relish. Preheat your oven to 180 deg C/ 350 deg F/gas mark four. Melt your butter and honey in a small pan. Sieve flour into a large bowl. Beat your eggs separately. Stir first the hot liquid then your eggs into your flour. If necessary add at splash of milk. Spoon your mixture into cup cake cases and bake for about 15 minutes or until golden and firm. If you want a topping, you could spread each cake with a little honey. Kids love gingerbread men (or women!) and they will go down a treat at any sugar free children’s party. This recipe also uses honey instead of sugar. Preheat your oven to 180 deg C/ 350 deg F/gas mark four. Melt your honey and butter in a small pan over a low heat. Sieve your dry ingredients into a large bowl. Stir the hot liquid into the flour etc to make a dough. Roll out to about 1/4ins thick on a lightly floured surface. Use a gingerbread man cutter to cut out shapes. Place on a greased baking sheet and bake for about 10 minutes. Remove from the heat. Press currants in for eyes and buttons. There are all sorts of wonderful recipes that can be made for children’s parties. And youngsters certainly don’t have to have sugar to have fun. Why not serve up some Sugar Free Ice Cream to cool your little monsters down at the end of a fun filled party!